You've confused the laws of physics with our understanding of them. You've confused the map with the territory. No......no, I haven't. The Copenhagen (I.E. vast majority) interpretation is that we know all of quantum function that is knowable.......you of course weren't aware of this, because this plainly isn't your field. 1. The rules of quantum mechanics tell you statistically where the particles will hit the screen, and will identify the bright bands where many particles are likely to hit and the dark bands where few particles are likely to hit. However, for a single particle, the rules of quantum mechanics cannot predict where the particle will actually be observed. What are the rules to determine where an individual particle is observed? 2. What happens to the particle in between the time it is emitted and the time that it is observed? The particle seems to be interacting with both slits and this appears inconsistent with the behavior of a point particle, yet when the particle is observed, one sees a point particle. 3. What causes the particle to appear to switch between statistical and non-statistical behaviors? When the particle is moving through the slits, its behavior appears to be described by a non-localized wave function which is travelling through both slits at the same time. Yet when the particle is observed it is never a diffuse non-localized wave packet, but appears to be a single point particle. 1. The probability statements made by quantum mechanics are irreducible in the sense that they don't just reflect our limited knowledge of some hidden variables. In classical physics, probabilities were used to describe the outcome of rolling a die, even though the process was thought to be deterministic. Probabilities were used to substitute for complete knowledge. By contrast, the Copenhagen interpretation holds that in quantum mechanics, measurement outcomes are fundamentally indeterministic. 2. Physics is the science of outcomes of measurement processes. Speculation beyond that cannot be justified. The Copenhagen interpretation rejects questions like "where was the particle before I measured its position" as meaningless. 3. The act of measurement causes an instantaneous "collapse of the wave function". This means that the measurement process randomly picks out exactly one of the many possibilities allowed for by the state's wave function, and the wave function instantaneously changes to reflect that pick. I don't see anything like what you say the interpretation is. Feel free to cite your own source, please. Waving Copenhagen Good-bye: Were the founders of Quantum Mechanics wrong? Violation of Bohr's Principle of Complementarity in an optical "which-way" experiment: Wave-particle duality has been a persistent enigma in the history of optics for more than two thousand years. With the advent of Quantum mechanics and following the famous Bohr-Einstein debate, Niels Bohr put forward his celebrated Principle of complementarity (PC) which allows presence of sharp wave-like and particle-like behaviors, only in mutually exclusive experiments. In a welcher weg or "which-way" experiment we can obtain perfect knowledge about the origin and path of quantum particles (particle-like behavior), but this action must lead to a complete destruction of the interference pattern (wave-like behavior). I will report a novel quantum optical "which-way" experiment, currently being duplicated at HEPL, which violates the predictions of PC. It seems that we can now finally settle the Bohr-Einstein debate in favor of Einstein! If time permits, we can also run a demonstration of the experiment after the seminar. It seems that we can now finally settle the Bohr-Einstein debate in favor of Einstein! Why, I do believe it does. I must apologize; I was aware of this experiment the whole time, and I could have saved us all a great deal of time by bringing it up before, but I was having no success finding the literature on the experiment until I literally stumbled across it. ok, you pick the two easy ones to post opinions to, but dodge the middle one. (1) obviously on a planet that does not freeze there is no problem. take mercury orbiting close to the sun with one side facing it and likely pools of molten metals. the fact that it is possible for such a system to exist means that freezing is no more of a problem than finding one example of a solar system that just happens to have close enough to good conditions for life to evolve. you have not refuted this point. (3) most arguments against the anthropic principle involve ammonia life? or most arguments against water? please be more precise in your responses: attempt clarity of thought, it helps. And what does it "fine tune" that is of note? It would operate in that manner in every place in the universe where there was water. Therefore the whole universe would be "tuned" and all you are saying is that "what is" looks like it is what it is because it is. The concept of "fine tuning" is to show that earth is special, but water on it's own does not do that: it exists throughout the universe and will be found in various forms on many planets in other star systems. And all the argument about water is that we know that in one instance life is based on water. This makes it highly likely that other life that exists is also based on water, but it does not require it to be so. You are using a data set of one (1) to make extrapolations for the whole universe, while also denigrating others for not considering alternate universes? Nic Tamzek. He pointed out the theoretical nature of your hypothesis and the sources of energy which would likely defeat it. Well I just took a look at Lam's post and if that is what you are counting on as a source for the opinion if water froze bottom-up all life would not exist, or even that all water would freeze, then it just casts a shadow over all your other claimed "sources". All Lam agreed to was that marine life in ice would not live, do to metabolism. I have already agreed with that as well. Most life does not do well in really cold temperatures, or to be more specific... ice. That is not the problem. Or should I say that only becomes a problem if it can be shown that all or most water is likely to freeze on earth due to a change in how water freezes. Well that simply is not the case. The biggest threat would be to freshwater marine life in temperate zones, or I suppose at high altitudes? I'm clueless when it comes to chemistry, so I have no idea how accurate your examples are.. I'm not asking you to be a genius in chemistry or even an acolyte. I am asking you to simply remember facts about the world and apply them. The above playing dumb is like saying you aren't sure if a match will light a cigarette because you don't know about chemistry. If you want to have ice in the tropics, do you set a glass outside or in a refrigerator? If you have no idea what the tropics are like go online and check what the temperature ranges are. Set your fridge for that temp (if it can even get as high as tropical lows) and stick a glass of water in there. Let me know when it freezes. Put a pan of water on a stove turned all the way up. Will it boil away, or freeze over? The temps at thermal vents are more than likely higher than that of your stove. So will ice form or not? Take two glasses of water. Put a bunch of salt in one of them. Then put both in the freezer. Check regularly and note which freezes first. Solar and geothermal energy (combined with our atmosphere of course) prevent the possibility of water freezing over completely in large bands across the globe. That is simply a fact. If it wasn't we'd be frozen solid no matter water froze top down or not. You should be able to think this through. Solar and geothermal energy (combined with our atmosphere of course) prevent the possibility of water freezing over completely in large bands across the globe. even during the ice ages there were parts of the oceans that were open water. Seriously? I didn't know that. Do you know where? I have to catch up with this thread so I may be on the wrong track here, but are we talking about the region around the equator? you actually have some evidence down near you: corral heads that are older than the last ice age and where cores show a continuous annual growth pattern. Well, it does get extremely hot where I live. So there were actually large bodies of open ocean during the ice age. These were mostly in the equatorial region, I assume? And marine life still flourished? What kind of temperatures are we talking about here? Were the oceans near freezing throughout or were there perhaps warm patches (deep sea vents, or something)? Imagine...all that coral out my back door and I never knew that about it. this one doesn't show the ice coverage but you can see the area between australia and china is forested islands -- also the area of the GBReef. 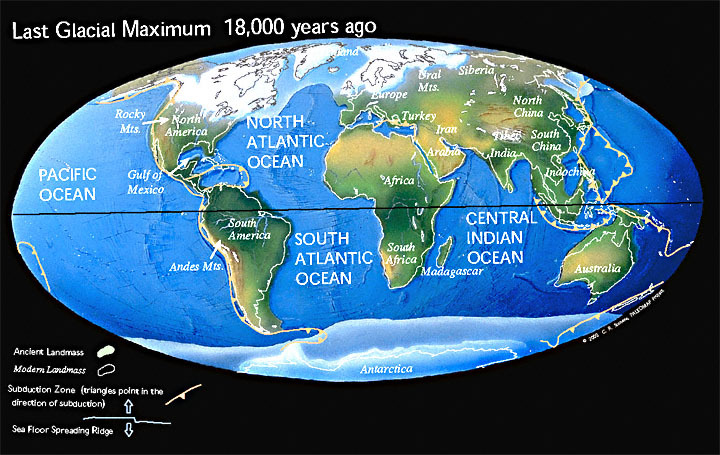 Main differences to previous ice ages would be the locations of the continents. Hey, thanks for the maps, RAZD! I'm a little lost, though. In the second map, am I to understand that all of the blue area was open sea during the ice age? And the bluish-white at the top and bottom represents the ice coverage? Is this correct? And here I was thinking that the ice ages turned the Earth into a big, spherical "icecube." that is correct. no the "ice-cube" earth is an image of the neanderthals dressed in furs following the hairy mammoths (which ate the dry grasses of the high desert ecosystem). it is an image that plays to our memories of winters, but the reality is a little more complex. remember these events lasted for thousands of years, so life survived in ice-free areas. thus there was substantial change to the climate around the world but not all went to ice. Would that be the italian ice age, or the ice cream age? I assume you are just joking, but for other indications we have vary long lived species that lasted through ice ages... including humans. Indeed if ice ages froze everything, I believe there wouldn't be any reptiles at all. A biologist could correct me on that one. Well, it just goes to show how bad common misconceptions can be. Ice ages aren't exactly my forte, mind you (as if you couldn't tell ), but I thought that during an ice age, in essence, "the Earth froze." Well, I knew there was a little more to it than that but I never would have imagined there were open oceans and areas free of ice. I suppose I really should have realized that. If the Earth's surface, in its entirety, were to freeze, is there any way that life could survive, in the long term? Not really. As I said, ice ages are one topic that I've really never given a great deal of thought. As such, I'm sure I have many misconceptions about them. Don't get me wrong, I didn't think that the Earth literally "froze solid" all the way through, like a round ice cube out of the freezer. I'm not that naive. I figured there were probably active oceans under the ice, and of course all the usual geological and seismic activity, but as far as the Earth's surface goes, I thought the ice was pretty much everywhere. I was surprised, for example, to learn that there were oceans that weren't frozen over. In retrospect, I don't know how I thought life could survive an entirely frozen environment. If I'd given it more than a cursory thought I may have considered that, but I've never looked into it. Always learning something new on these forums I am.